I have a particular interest in understanding how tissue micro-environments influence immune cell function in inflammation/infection. I completed my BSc in Biochemistry/Zoology and later PhD in Immunology/Virology at the Centre for Perinatal infection research at Sydney University, Australia. During my PhD, I investigated the functional specialisation of skin dendritic cell (DC) subsets during herpes simplex virus infection defining their individual roles in anti-viral skin immunity. I then made the move to Hannover, Germany on a postdoc career in the Sparwasser lab. Here I investigated the biology of plasmacytoid DC using RNA and DNA viral models with a specific emphasis on understanding their utilisation of TLR/MyD88 sensor proteins in lymphoid and non-lymphoid tissues including lungs. 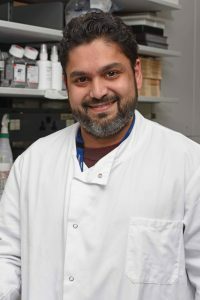 In 2016, I joined the Lloyd lab at Imperial College London where I am currently using precision-cut lung-slice model and intra-vital imaging to visualize immune cell dynamics and their communication with lung environmental factors during inflammation.